06 Feb Mauritius: its religions, its philosophy, and most importantly, its food! Multicultural, peacefully coexisting, respectful of each others’ religious traditions and philosophies. These are all descriptions that can be applied to the population of Mauritius. And it is certainly the pride of this minuscule island nation situated in the central western part of the Indian Ocean. Mauritius is a melting pot of cultures; this characteristic has immensely influenced the lifestyle, culinary originality and general sense of tolerance of the Mauritian people. Mauritius is a secular state, so it does not have any official religion. The three prominent religions by order of plurality are Hinduism, Christianism, Islam, respectively. With such a diverse cultures, the Mauritian calendar is rather populated with public holidays. Joyous occasions and celebrations are never too far apart on the land of the Dodo! A foible of the Mauritian population is to exchange traditional cakes when celebrating religious and cultural events. The Hindus do it for Divali, the Sino-Mauritian Chinese for Chinese New Year, the Muslim for Eid Ul-Fitr, and the Christian for the Fete de l’Assomption (Feast of Assumption). Our cuisine is as rich as our culture! The Mine Bouillie and Mine Frire (Sino-Mauritian boiled and fried noodles). Boiled noodles are normally served with pork charsiu, in traditional Sino-Mauritian snacks. Snacks are mini restaurants that can be found anywhere from bustling town centres to quiet residential suburbs. The Sino-Mauritian Riz Frit is also to be tried, if you are partial to rice dishes. Fun fact: Pork dishes can be rare to find in Mauritius, because traditional Hindus and Muslims do not consume this type of meat. The Mauritian Briyani – no, we do not spell it Biryani, and neither do we pronounce it this way –is also a must-try! 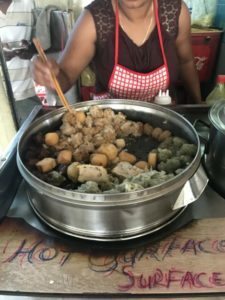 Navigation: Mauritius Explored Local Guide - Best Activities > Blog > Culture > Mauritius: its religions, its philosophy, and most importantly, its food!